We have your first look into the world of Saif Ali Khan’s Kaalakaandi. The film, which is a raucous tale about life, death, karma, that barrels through one monsoon night in Mumbai, talks about the journey of six characters from different walks of life. 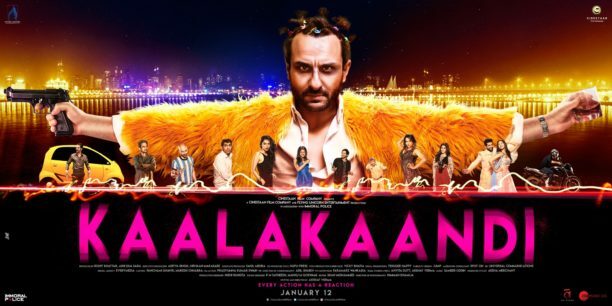 Kaalakaandi’s trailer takes us on a rollercoaster ride with star Saif Ali Khan as you have never seen him before along with the eclectic ensemble of Deepak Dobriyal, Vijay Raaz, Kunaal Roy Kapur, Sobhita Dhulipala, Akshay Oberoi, Isha Talwar, Shenaz Treasury, Shivam Patil, Amyra Dastur, Nary Singh and Neil Bhoopalam. The film marks the directorial debut of ‘Delhi Belly’ writer Akshat Verma. Check out the very intriguing trailer! Produced by Cinestaan Film Company and Ashi Dua Sara of Flying Unicorn, Kaalakaandi will release on 12th January 2018.